I sat around last Sunday (Super bowl Sunday) and tried to recall past Super bowl Sundays with my family and friends. The problem that I have with “special days” in prison is the flood of memories that can overwhelm me and cause me to long for my old life. 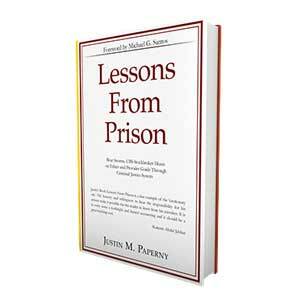 It can be very difficult at times but it is all part of the “prison experience”. Well, my old life is over and a new one awaits me once I leave here. I will say that my fellow prisoners were very excited about Super bowl Sunday and seemed to be in very good spirits. That is an unusual vibe to experience in prison. In Pensacola, the staff gives out popcorn before the game which is a special treat. A bunch of us watched the game in the visitation room on the movie viewing screen. Many prisoners prepared special meals to eat during the game. It is truly one of the only times I could describe the prison mood as festive. Once the game started, it was very, very loud. (think of your favorite sports bar with the volume level doubled.) Some prisoners made “team jerseys” out of old tee-shirts to show support for their team. There was a bit of an issue after the game ended. Apparently, one prisoner set up a football squares game. (gambling is illegal in prisoner). Prisoners buy squares with $1.00 stamps which is the currency of choice in prison. (mackerel packages are a distant second). The prisoner’s square game sold out and the rules stated that it would pay out a percentage of the pot at the end of each quarter. The guy with the 8-8 square (score 28-28 at end of 4th quarter) showed up to collect the big prize. So did the guy with the 4-8 square (score 34-28 in overtime at the end of the game). A huge verbal confrontation occurred as each prisoner believed that they were the rightful winner. I was told that the Winners finally agreed to share the pot and both walked away unhappy. This is another reason why you never gamble in prison. My 31st wedding anniversary is tomorrow. My wife is going to visit this weekend. We have spent past anniversaries’ in Florida at some beautiful spots. I suspect my wife has no problem spending our anniversary in Florida but I am quite sure she would not pick the Pensacola visiting room as an appropriate destination. The good news is that next year, we will celebrate our anniversary at an appropriate location. I wanted to let all of you know that the older gentleman from Pensacola Camp who went back to prison for taking his wife’s pain medication after oral surgery has been released back to home confinement. Apparently, the disciplinary staff ruled that his use of the medication was excused because He did have an unfilled prescription for the medication. Good news for him and his family.